Flourless chocolate cake is a classic restaurant dessert. It can be one of the best cakes you’ll eat, or pretty dull, depending on the ingredients and technique used. A really great flourless cake honestly isn’t difficult to make as long as you follow a few essential tips for baking. Today I’m going to show you how to make a flourless chocolate cake that’s rich and silky smooth, and would do any restaurant dessert menu proud. This happens to be a gluten and nut free chocolate cake too, and it actually tastes best if you bake it a day ahead. In my book, that makes it a great recipe to keep on hand if you’re entertaining and have to cater to special dietary requirements, but don’t want to bake a separate dessert. Can’t I just make a regular chocolate cake? Sure you can. In fact, I have a fantastic Simple Chocolate Cake recipe right on this very website, that I make all the time. It’s a brilliant ‘everyday’ bake that you can whip up quickly and which keeps and travels well. 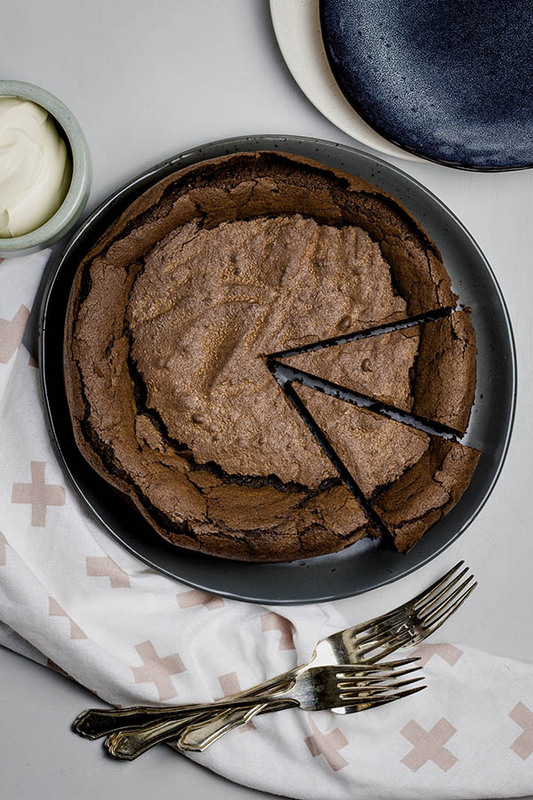 If you want to go all out on an impressive (but still not-too-difficult, make-ahead) dessert, though, this flourless cake is like the grown-up version of the simple chocolate cake. It needs a little more attention and care when baking, but you’ll be duly rewarded with a dessert that’s rich, smooth and silky, and tastes so cleanly of pure, fantastic chocolate that you may not want to share. It’s a good thing it’s so rich, otherwise sharing really would be off the table. This is a gluten and grain free chocolate cake, and unlike many flourless cakes, it’s also nut free. That means there’s no ‘filler’ ingredients for the flavors to hide behind. You’re going to taste the quality of your butter, cocoa, vanilla, and most importantly your chocolate, so if ever there was a time to spring for the good stuff this is it. When it comes to choosing chocolate, a lot of brands, including some of the supermarket ones, now print the percentage of cocoa solids on the package. This is great for consumers because it means you know exactly how dark the chocolate you’re buying is going to be. For the chocolate in this recipe I recommend something in the region of 50-70% cocoa solids. Anything less will put you into milk chocolate territory, where dairy is added to the chocolate and the flavour is too mellow and sweet. Much higher than 70% will leave you with a cake that’s too dark and not sweet enough for the average person to enjoy. I use a Callebaut 54% dark chocolate for most of my baking, although I have also used a 62% dark in this cake and it was great. The Callebaut is great quality and it’s easy for me to buy in a large block and chop into chunks whenever I need it. I find it better than keeping chocolate chips around. With chips, I may be known to munch my way through the bag a little at a time when I can just grab a handful. Removing easy temptation is worthwhile if I want to retain any semblance of healthy eating! The butter you use in this cake shouldn’t have too much water in it, which might sound odd if you’ve never looked at the ingredients on a package of butter! In the USA and Australia (and many other countries), regular butter contains around 80% butterfat. Most of the rest of that block is water, because, well, water is cheaper than butter! For a lot of recipes it doesn’t make too much difference, but in baking I like to use a higher fat European style butter, which contains around 85% butterfat. The extra water in non-European butters can change the texture of your baked goods, especially when it comes to rising of batters, because the water evaporates within the food and leaves air pockets. Choosing the best vanilla for your cake – extract, paste, essence or whole beans? Vanilla essence, which is chemically produced, is the cheapest vanilla flavoring on the market and tastes (to me, at least) pretty yuck. Vanilla extract is just that – whole vanilla pods from which the flavor and aroma has been extracted. It’s sold in liquid form, like vanilla essence. Vanilla paste is the vanilla beans and sometimes pods, ground into a fine paste. Either extract or paste is fine in this recipe, or if you really want to go all out, split a whole vanilla pod and scrape the seeds directly into your cake batter. Please don’t use vanilla essence (ever), it leaves a strange chemical aftertaste to your baked goods and I honestly don’t think anyone who spends the time and effort to bake a nice cake or cookie wants that. Real vanilla is expensive but you don’t need a lot. I believe it’s worth it for the incredible aroma and flavor it brings to your baking. I use Dutch processed cocoa in almost all recipes calling for cocoa. It’s the most stable and has the smoothest taste and texture, but if you’d like a short lesson in the types and differences between cocoa and cacao powders so you can make your own decision, read on. Cocoa powder is unsweetened and comes from the fermented, dried, roasted and finely ground beans of the cacao plant. In recent years raw cacao powder, which is also unsweetened but comes from cold pressed, unroasted cocoa beans, has become more widely available because of its reputation as a superfood ingredient rich in antioxidants, magnesium and lots of other beneficial trace elements. Cacao retains more nutrients than cocoa because it’s not heated in processing, but although it can be interchanged for cocoa in some recipes, it is more bitter and absorbs more liquid than its processed cousin. I haven’t tried it in this recipe but experience tells me it would make for a more densely textured and possibly slightly grainy cake. Cocoa comes in either a ‘natural’ form or in ‘Dutch processed’ form. Dutch processed cocoa has been alkalized to neutralize the cocoa’s acidity. The difference between alkalized and natural cocoa can be really important to some recipes, although it’s not critical to the success of this one. Basically, the alkalizing process affects the way cocoa interacts with other ingredients, especially leaveners like baking soda and baking powder. Baking soda requires an acid in order to form the chemical reaction that makes a batter or dough rise, so if you were to use alkalized (Dutch) cocoa in a recipe calling for natural cocoa, you’d get a flatter result unless you substituted baking powder for soda, or added another type of acid in the form of, say, lemon juice or vinegar. Now that we’ve gone into minute detail about your ingredients for this cake, let’s talk about what you need to know to bake it! The key techniques you need to get a grip on are separating and then whipping egg whites to a meringue consistency, and folding the chocolate batter and meringue together. The rest of this cake basically just requires melting and mixing ingredients, but the egg whites are the difference between a totally flat and heavy cake and a dense yet soft-textured one. If you have a stand mixer, or a whisk and some good arm muscles, and a decent sized metal spoon, this is all fairly straightforward. First you’re going to separate your egg yolks from the whites. The whites need to be completely free of any yolk in order to whip properly – even a tiny trace of egg yolk will leave you with flat meringue. If you’ve never separated an egg before, my best tip is to work with cold eggs straight from the fridge. Gently crack the egg, then hold it upright in one hand while lifting off the top half of the shell, allowing the white to spill into a bowl underneath. Tip the yolk and any remaining white into your free hand, and let the excess white also run into the bowl so you’re just left with the sphere of yolk. Pop the yolk into a separate bowl, and continue on until all your eggs are done. If any yolks break and traces of them end up in your whites, you’ll have to carefully fish these traces out (or start again if you can’t). If you’re worried about broken yolks, separate the whites into a different bowl and then tip them into the mixer bowl one by one as you go. That way if you lose one egg white to a broken yolk, you won’t have to start from scratch. When it’s time to whip those egg whites, you first want to get them to a soft peak consistency. You’re aiming for something that looks like bubble bath: small, even, visible bubbles, and when you lift a whisk or mixer out of the egg, it should softly droop down onto itself. Have a look at the image below to see what I mean. When your egg whites are at soft peaks, it’s time to start adding the sugar. Add a couple of tablespoons at a time, with the mixer running (if you’re whisking and have someone else you can call on for extra hands, get them to gradually add the sugar while you keep whisking). As the sugar is incorporated, the egg will get whiter, fluffier and increase in volume. By the point all the sugar has gone in, it should look glossy, thick and foamy with no visible bubbles, and it should hold stiff peaks when the whisk is lifted up. If you rub a little of the mixture between two fingers, it should feel smooth, not gritty (if it is gritty, beat for a little longer to dissolve the sugar). When you’ve made the chocolate batter and beaten your egg whites into meringue, it’s time to put them together. Don’t just dump everything in one bowl and mix enthusiastically, or you’ll lose all the airy texture of the egg whites. Instead, you’ll mix a little of the meringue into the cake batter to loosen it, and for the rest you’ll fold it in. Gently. Folding egg whites into a cake is best done with a wide, flexible spatula or a large metal spoon, which can scoop under and around the mixture and fold it back on top of itself without being too heavy and deflating the whites. Stop folding when you no longer see streaks of egg white or darker, unmixed chocolate batter. The mixture may not look completely smooth, but as long as everything is incorporated that’s fine. My flourless chocolate cake sank after baking! Don’t panic. It’s meant to do that. In fact, I’ve seen this cake referred to as sunken chocolate cake before, which is quite apt. Most cakes, or at least the ones with leavening agents in them, rise somewhat in the oven. The air bubbles which create that rise get ‘locked in’ when protein from the eggs cooks and binds with the gluten and/or starch of the flour you’ve put in there. In the case of a flourless chocolate cake, there’s obviously no flour, and nothing much to hold that structure high, so although your cake is going to puff up like a beautifully domed souffle in the oven, it’ll gently sigh its way down after baking. Instead of a cake batter that doesn’t rise at all (think brownies or heavy, nut-based cakes), this one does get some leavening action from the air you whip into the egg whites. It’s not going to be completely dense and fudgy but somewhere in between, with a smooth texture you’ll never get from a flour-based cake, and a thin, crackly meringue-like top. After all your hard work, you really want this to be the perfect slice of cake when you serve it up, right? If you want chocolate cake to taste its best, don’t serve it cold. Room temperature or slightly warmed will bring out the flavour of the chocolate best. The flavours and aromas of chocolate are dulled by cold temperatures, so if you’ve invested in great chocolate for baking don’t waste that investment. Here’s the rub when it comes to serving a flourless chocolate cake, though: the best way to get a clean slice is to cut a cold cake! Flourless cakes are hard to cut nicely because they can be quite sticky, and this one is no exception. If you aren’t too worried about a clean cut, keep your cake at room temperature and just use a heated knife that’s wiped off between each cut. It’ll still look good and once people taste it, no one will be complaining that it wasn’t as neat as it could be! If I really want to serve perfect looking slices, I chill my cake, then remove it from the fridge at least half an hour before I want to serve. I cut the cake straight from the fridge, and when it’s time to serve, it will have warmed up and be easy to put beautiful slices on your plates. 1. Preheat oven to 180°C/350°F. Use 1 tbs of your butter to rub all over the inside of a 22cm/9in springform pan, then line the base and sides of the pan with baking or parchment paper (the paper will stick to the butter and stay put). 2. Place the remaining butter and the chocolate into a large heatproof bowl. Set the bowl over a saucepan with a couple of inches of water in the bottom (make sure the water doesn’t touch the bottom of the bowl), and place the pan over medium heat so the water comes just to simmering point. Melt the butter and chocolate, stirring every now and then, until it’s completely smooth, then remove from heat and allow to cool for a few minutes so the mixture is lukewarm. 3. Using a whisk, mix the egg yolks into the cooled chocolate and butter. Add the sieved cocoa powder and salt and whisk well to combine, then whisk in the vanilla. 4. Put the egg whites into the bowl of a stand mixer fitted with the whisk attachment (you can do this step by hand with a large whisk, but you’ll have to get your arm muscles ready!). Whisk on medium-high speed just until the whites form very soft peaks when you lift the whisk. 5. Reduce your mixer speed to medium and slowly begin adding the sugar to the egg whites. Continue whisking and adding the sugar a couple of tablespoons at a time, until the sugar is used up and the mixture forms glossy, stiff peaks when you lift the whisk. If you rub a little of this mixture between your fingers it should feel smooth, with no grittiness from the sugar at all. 6. Using a metal spoon or a spatula, stir about a quarter of the egg white mixture into the chocolate mixture until combined. Then, working gently, scoop the rest of the egg white mix into the chocolate bowl and fold together until everything is just mixed and there are no streaks of egg white. The aim is to keep as much air in the batter as possible, so don’t overmix. 7. Gently pour the batter into the lined pan and smooth the top. Bake until the cake is set and barely risen, with a thin crust on top, about 35 minutes. It will not test clean with a skewer, but should be set enough that it doesn’t jiggle when you move the pan. 8. Cool the cake completely in the pan before removing and serving in thin slices with extra melted chocolate and thick cream or ice cream. Over to you – if you try this recipe I’d love to know about it! Share your comments below or on Facebook, tag @steamandbake on Instagram, or pin all your favourite Steam and Bake recipes to Pinterest using the buttons on the images in this post! Would you like more recipes and tips to help you cook with confidence? Join the mailing list to be alerted to new posts.